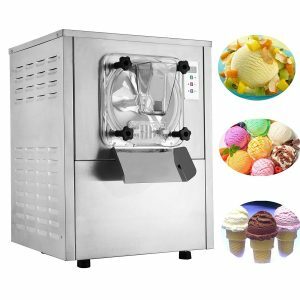 Happybuy BQL-112Y is a hard ice cream machine that is made of 304 stainless steel and food grade materials overall and has a 20 liter per hour ice cream making capacity with its 1400 watt motor (110V) and a rotating speed of 3000 r/min. It can be used in a variety of commercial settings, camps, churches, dessert shops, milk-tea stores, cafes, bars, restaurants, bakeries, fruit juice bars, recreation centers or at home. 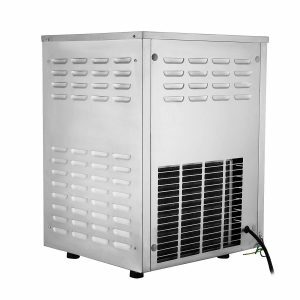 You also have the option to get it with a 1500W motor for an ice cream making capacity of 15 to 22 L/h. It has an average rating of 3.7 stars on the day of this page. But with only 8 reviews it is a case of a couple of people rating it 1 star because of an issue with the replacement parts etc. The other 6 ratings are all five stars by very happy and satisfied customers. The 20L/H capacity is equal to 5.28 Gal/H for those not familiar with the liters. You can do a batch every quarter of an hour and please clean the ice cream maker between different batches unless you’ll be making the same flavor in the next one. HappyBuy runs fairly quietly at noise level of less than 40 decibels during the cooling (compressor doing the cycles) and totally quiet otherwise. It weighs 143.3 pounds and measures 20.66 x 19.29 x 25.19 inches, has an ingredient bucket height of 4.52” and a bucket diameter of 8.46 inches. The feed port is a good quality food grade PVC that is durable with a sturdy build. HappyBuy Ice Cream Machine has a new design LCD display panel connected to a smart microcomputer with an easy to read and manage interface and the time indicator- auto counting feature. When your ice cream is ready the unit will tell you with an alert tone. There will be no leaking of the ingredients with the 0-shaped detent ring that ensures proper sealing. It freezes very rapidly thanks to the R404 refrigerant and a very large refrigeration cylinder. The power usage is reduced on this model and will help with your energy bills. It comes with a variety of built-in security features like the class 1 electric shock resistance, the rectangular grid distribution air vents to maintain the internal temperature at a certain level to prevent the damage due to overheating, and the auto-diagnose malfunction. Please note that this machine needs ice cream mix to make ice cream. But you can make gelato and different types of frozen desserts by just playing with the freezing time. If you want less consistency you can simply set the timer for a shorter time and longer if you want it thicker. You can add fruit pieces, nuts or other ingredients into your ice-cream and you shall have no problems. Ice cream mix is made of heavy cream, whole milk and sugar. But for soft serve ice cream you need a different type of machine. One batch is just a little over a gallon. Apart from the drip part at the front this machine is very well constructed, but you won’t have a problem with the drip either. Overall you’re getting good value for the dollar.